NX-C6000：VoIP Traffic Visualization | Solutions & Services | NextGen, Inc.
Telecom VoIP networks for the IP telephony services deal with tons of calls on a daily basis and a single NX-C6000 IDS (Intrusion Detection System) observes overall traffic generated by more than 50 telecom systems such as softswitches, session border controllers, PSTN (Public Switched Telephone Network) gateways, and so forth. Graph of the traffic flows that match preconfigured conditions such as types of SIP messages, IP addresses or IP address groups, VLANs, particular telephone numbers, and the like. List of highest amount of traffic flows per unit time on an IP address or a telephone number basis. SIP signaling sequence display for the purpose of checking message flow conditions. SNMP traps or email to warn of traffic fluctuation (e.g., service outage or overload conditions) and of some suspicious SIP messages. The visualization above is very helpful for telecom operators to keep watch their network situation. 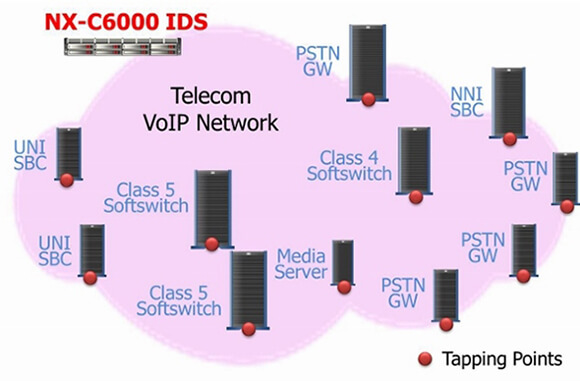 NX-C6000 IDS observes VoIP traffic fluctuations in real time and if there is a big change (higher or lower volume of traffic than constant rate) then warns technical support personnel to activate.For example, if the amount of REGISTER messages in a particular section is far below the limit or if recursions of call requests from an indefinite number of devices happen one after another, it is considered to be a failure of an intermediate network system or link. Network systems in failure condition often do not send any alarms so that detection of the event may be delayed. NX-C6000 IDS find the event in real time and works out such issue. A single NX-C6000 IDS addresses an average of 34,000 messages per second and 1.1 billions of messages on a daily basis in real time. Massive messages may occur in the DoS attacks case but NX-C6000 IDS could discard lower priority messages like REGISTER and continues to execute its statistics processing of higher priority messages for call processing. Copyright NEXTGEN All Rights reserved.